Blogging is important. Here's 5 ways to make it more manageable. Sir Francis Bacon (pictured here, on one of his better hair days) was a man ahead of his time. 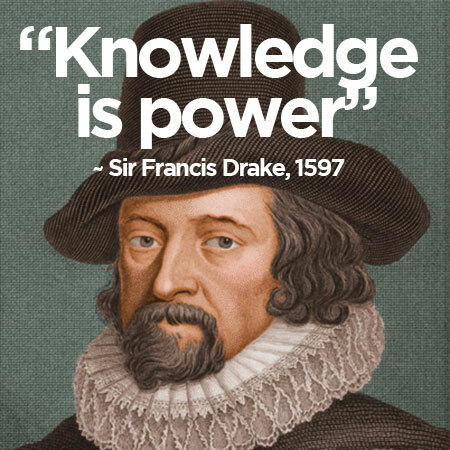 In 1597, the coined the phrase "Knowledge is Power," when he was blogging, ummm, we mean writing his book, "Meditationes Sacrae and Human Philosophy." It was an insightful perspective because it's as true today, as it was in the 16th century. Anyone in business should relate to Sir Francis, and that's especially those of us in marketing. Knowledge is power, because when people know you posses knowledge in your industry, knowledge that can help them, it instills confidence in you. Blogging is all about sharing your knowledge with customers and prospects. Because when someone sees you know your stuff, when those people need your stuff, they'll come calling. To jump right to the 5 tips, click here. Blogging shows knowledge, and you're an expert in your industry. When you blog, you offer opinions and answer questions about why someone needs what you're offering. When you blog, as we do regularly, you're building a database of information accessible to your audience. The more you blog, the more you're updating your website. The more you update your website, the more search engines re-index it. The more it's re-indexed, the more relevant it is in search engines. Writing blogs helps with your website's ranking, as long as you use the same keywords in your blog as your audience is using when searching for your product or service. Using keywords when blogging is a whole other topic, which, what a coincidence, we've also blogged about. Use the keywords in the Alt Text fields. Blogging is time-consuming (when done correctly). How long does it take? This study from Hubspot shows writing a blog can take between 1 and 4 hours, so plan on at least a couple of hours per blog. And that's for a relatively short blog (500 words). While short-form blogging is making a comeback, some topics just require more words. This blog, for example, is 1,300 words. Now that you know blogging is a good idea, how do you get ideas and find the time to do it? Here are 5 tips for making blogging easier. The way to get someone to find your blog is to incorporate the same keywords a prospect uses to find your products or services. But you should never guess at what keywords people use. That is a sure way to waste time blogging. If a home builder used the word "homebuilder" (as one word) as their keyword, they'd be wasting their time, because people search for home builders using "home builder" as two words. The phrase "physical therapist" has 200 searches a month for it, while the phrase "physical therapy" has 1,000 searches a month. If an architect used the keyword "architecture company," that phrase has 10 searches a month in Columbus, while the word "architect" has 590 searches a month. 2. Know what to write about. For a never ending source of inspiration, subscribe to blogs written by people smarter than you. You'll find their stories often initiate ideas for you. Remember don't write about you, but about what you DO that helps your clients. Cut down on TV. If you cut out just one TV show, that frees up an hour a week. Watching one less game each month. That gives you three hours to put into a blog that can be helpful to your marketing efforts for months, or years, to come. Have a "working lunch" and write over lunch. It might take a few lunch hours to finish your blog, but doing it in pieces is sometimes easier than finding 2 hours at once. Share the work. If this is a new area for you, taking this on yourself is tough, so get help. If you have other sales folks, have them write a blog and you edit it. Maybe someone in your office, not in sales helped a client and they can write about it. Guest blogging. Maybe a supplier, or vendor, someone you work with can help. We have several other folks writing blogs for us in exchange for links back to their websites, like this article about Google Ads, or this one covering tips for running a website audit. Add the SEO to the blog, which includes adding the Page Titles and Meta Descriptions. Watch the first 40 seconds of this video to see how Google uses the Page Titles and Meta Descriptons that are added to every page of your website. This is critical, and if you don't know how to do it, you're not blogging the right way. Find and buy the images for you. A web design firm that has an account with a stock photo service can probably get them less expensively than you. Plus, they can think of less traditional images than you might consider using. Everyone has seen the traditional stock images, but there are always good options. See below for an example of an expected photo vs. one that offers a different, more interesting perspective. Better images also make the blogs more interesting. See below for an example. Name and prepare for web, the images used in the blog. Not only do photos have to be sized correctly, they have to be the right file size (ie: 75KB instead of 1 MB) to load fast. Load time is a ranking factor for Google.